Regular followers of Sailu’s Kitchen will know our family’s love for eggs in all its avatars. 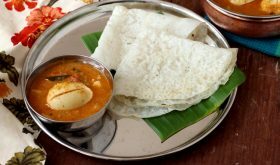 I am always on the lookout for the best dishes with egg especially curry based recipes that go well with dosa, appam, neer dosa and rice. There is never any dearth for authentic Indian regional egg recipes and I tend to go for curries that have unique spice blends. Mangalorean egg curry is a coconut based curry that calls for a unique blend of spices like mustard seeds, cumin, coriander seeds, fenugreek seeds, red chillis and tamarind. For a deeper coconut flavor, one can add coconut milk instead of water while cooking the curry. 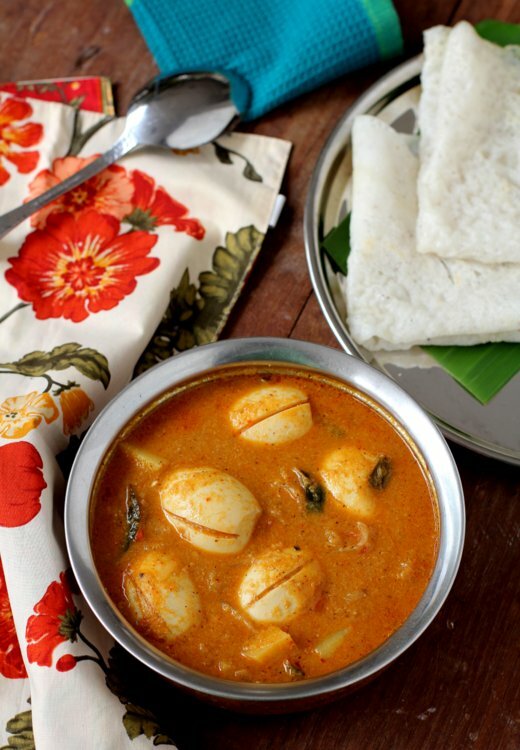 A classic egg curry among Mangalore food recipes that makes for a perfect dish with steamed rice, dosa or chapati. Dry roast mustard seeds and methi seeds for 2 mts. Add coriander seeds, cumin seeds and red chilis and saute for 4 mts on low flame. Remove from pan and set aside. In the same pan, add 1 1/2 tbsps of oil and add sliced onions and saute for 6-7 mts or till lightly browned. Add turmeric powder, garlic and grated coconut and saute for another 2-3 mts. Turn off flame and cool. Grind the roasted spices coarsely, add the sauteed onion-coconut and tamarind and grind to a fine paste adding little water or coconut milk. Set aside. Heat 2 tbsps of oil in a heavy cooking vessel, add carom seeds and allow to splutter. Add cinnamon stick and curry leaves and saute for a few secs. Add the sliced onions and saute for 3 mts. Add the ground paste and cook for 5 mts, stirring continuously. Add tomato pieces and mix. Saute for 4 mts. Add salt and cubed potatoes and saute for another 4 mts. Add 3 cups of water and allow to come to a boil. Reduce flame, add the boiled and slit eggs and simmer for 20 mts. Add coconut milk (if using) and mix well. Simmer for 2 mts and turn off flame. Remove to a serving bowl, Serve hot with appam, neer dosa or steamed rice. You can add 1/2 cup coconut milk towards the end of the cooking process. If not adding coconut milk, use 3 1/2 cups of water. By Sailu Published: June 25, 2014 Mangalorean egg curry recipe is made with boiled eggs, coconut & red chilis. 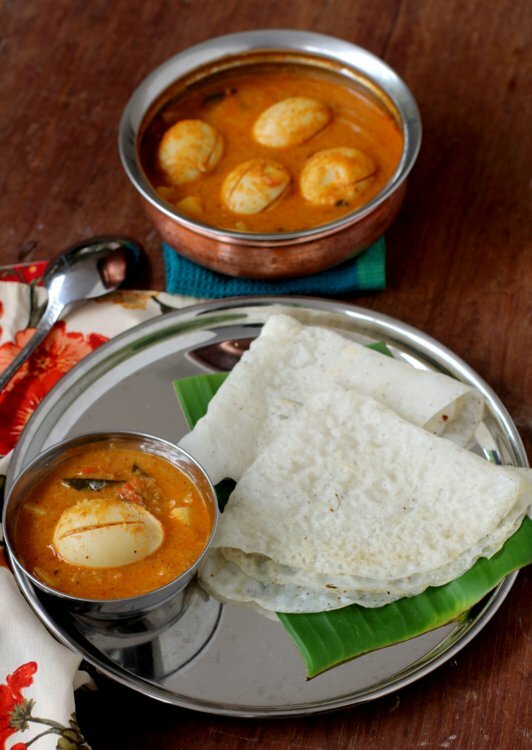 One of the authentic & best dishes with egg in Mangalore food recipes category. Coastal Karnataka (in India) specialty Dosa (similar to pan cake in western countries) made from a batter of rice and coconut. Search for cuisines from Udupi or Mangalore, you will get more information on it.